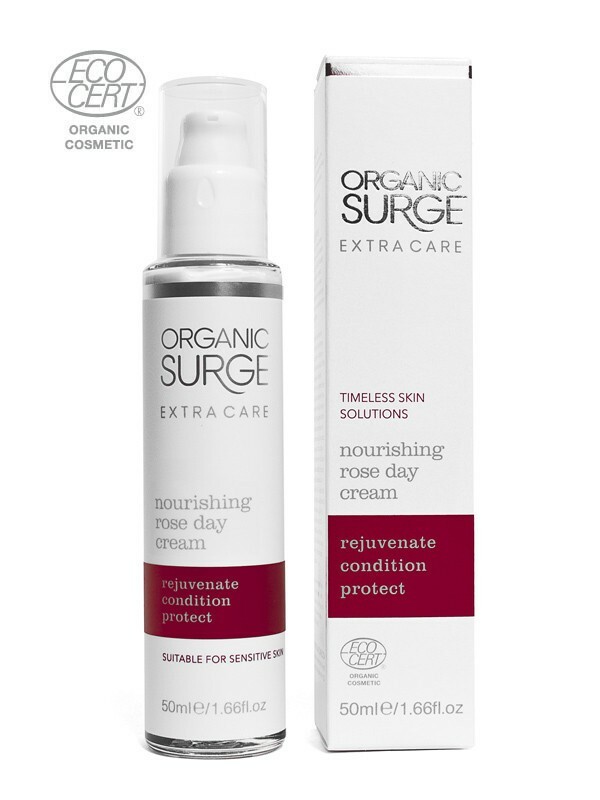 Organic Surge's Extra Care Range features natural face and body creams, lotions and serums which hold the key to timeless, healthy skin. Their new Rose Organic Day Cream is a rich, caring, nourishing day time formula that helps to counteract fine lines, leaving your skin hydrated, nourished and bursting with health. Packed with organic ingredients and plenty of nutrients, this luxurious natural cream provides instant hydration and nutrition to dry and sensitive skin. Argan oil will nourish your skin, whilst damask rose oil will calm redness. The palmarosa and geranium oils will infuse your skin with vital moisture for a luminous and supple complexion, whilst supporting your skin's natural age-defying defences. 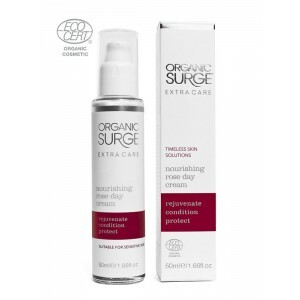 For extra hydration use Organic Surge Replenishing Facial Oil underneath. Aqua / Water, Aloe Barbadensis Leaf Juice*, Argania Spinosa Kernel Oil*, Glyceryl Stearate SE, Cetearyl Alcohol, Coco-Caprylate, Glycerin, Myristyl Myristate, Cocos Nucifera (Coconut) Oil*, Cetyl Ricinoleate, Benzyl Alcohol, Glyceryl Caprylate, Sodium Stearoyl Glutamate, Rhus Verniciflua Peel Wax (Cera) , Pelargonium Graveolens Flower Oil, Xanthan Gum, Carrageenan, Citric Acid, Sodium Phytate, Argania Spinosa Leaf Extract, Dehydroacetic Acid, Cymbopogon Martini Oil, Maltodextrin, Sodium Hyaluronate, Alcohol, Citrus Sinensis Peel Oil Expressed, Illicium Verum (Anise) Fruit/Seed Oil, Mentha Arvensis Leaf Oil, Rosa Damascena Flower Oil, Citral, Citronellol, Geraniol, Limonene, Linalool. *ingredient from organic farming. Naturally occurring within essential oils. Natural and Organic Cosmetic certified by ECOCERT Greenlife. 99% of the total ingredients are from natural origin. 17% of the ingredients are from Organic Farming. Apply after cleansing by massaging into your face and neck with gentle upward strokes.